… the December Consumer Price Index number released earlier this month showed that prices declined by 0.1% over the previous month. Granted, it was a small decline over a period of just one month, but when prices fall, that’s called deflation. Moore has used judicious rounding. The exact calculation based on the level of the index itself, the month-on-month (m/m) decline is 0.06%, and on an annualized basis 0.7%. More to the point, the 0.06% decline should be placed in the context of the variability of the CPI, which on a m/m basis is 0.26 percentage points (standard deviation, over the Great Moderation period, 1986-2018). In other words, this is nowhere near a statistically significant decline. Users should exercise caution when using CPI estimates to make inferences about index changes for relatively short time periods, for individual goods and services, or for local areas. The standard errors of those estimates may be on the same order of magnitude as the estimates themselves; and, thus, few inferences about them are reliable. I think Mr. Moore, had he learned some macroeconomics and statistics, would be advised to consider the correlation between the dollar and commodity prices, as discussed here. 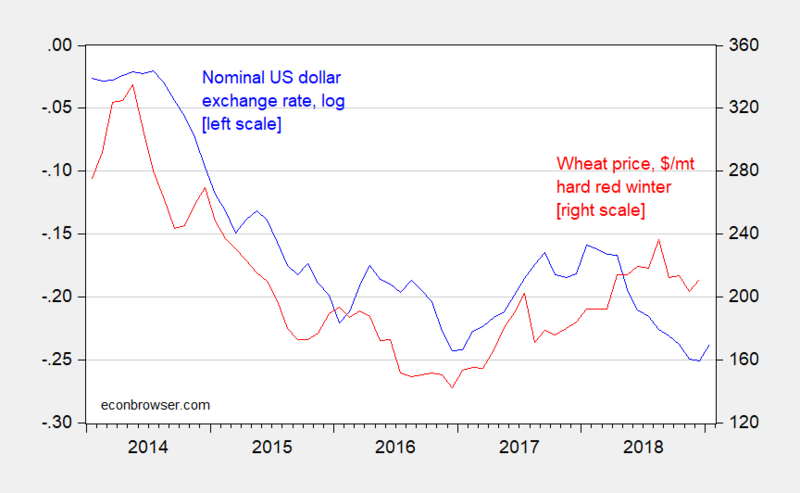 Figure 1: US dollar nominal trade weighted exchange rate (down is appreciation) in logs, (blue, left scale), and price of wheat (hard red winter), $/mt (red, right log scale). Source: Federal Reserve via FRED, World Bank. The evidence that commodity price shocks lead to sustained inflation effects is weak; for recent analysis, see here. Bottom line: CNN – fire Stephen Moore. This entry was posted on January 28, 2019 by Menzie Chinn. The investment made by the Russians in Trump is really paying off! WASHINGTON/MOSCOW (Reuters) – U.S. President Donald Trump’s administration on Sunday lifted sanctions on the core empire of Russian tycoon Oleg Deripaska, including aluminum giant Rusal and its parent En+, despite a Democrat-led push to maintain them. The move, which sent the Russian stock index to an all-time high, has watered down the toughest penalties imposed since Moscow’s 2014 annexation of Crimea, following a lobbying campaign in the United States that lasted almost 10 months. Hong-Kong listed shares in Rusal, the world’s largest aluminum producer outside China, hit their highest since April on Monday, rising 9 percent. Aluminum prices on the London Metal Exchange (LME) dropped as much as 1.4 percent after the open. The sanctions had sent London aluminum to a seven-year high when they were announced in April last year amid fears of a supply squeeze. On Monday, the LME said it had lifted its suspension on storing Rusal-produced metal in LME-approved warehouses with immediate effect. “Members may freely enter into contracts with Rusal and its affiliates,” the LME said in a statement. The same BLS release noted a 1.9% increase from 12/2017 to 12/2018. But let’s have FRED draw a chart! Brad DeLong has a lot of posts up involving the run-up and follow-up to his joint discussion with Mr. Moore. How Brad sat calmly listening to this clown lie for over an hour is beyond me. In 2017 we imported $17 billion from Russia. A lot of that was oil. But we imported over $1.5 billion in aluminum from Russia. Country specific tariffs on this product where Russia is exempt is a nice way for line the pockets of those Russian oligarchs that put Trump in the White House. By coincidence, I debated Steve Moore yesterday at San Francisco’s Commonwealth Club. I had debated him two years ago on Trish Reagan’s Fox Business show. Back in 2015, when he wanted to work for Marco Rubio, Steve was in favor of the Trans-Pacific Partnership. But by the time I debated him on Fox Business in 2016 he wanted to work for Donald Trump, who had called the TPP the second-worst trade deal in American history, and so Moore was strongly against it. Yesterday in 2019 he seemed to be for the TPP, and to regret that the U.S. had not joined it—at least he did acknowledge that the U.S. would have more leverage now in its negotiations with China over intellectual property if it were negotiating as part of the TPP group rather than, as we now are, going it alone. An “economist” for all seasons (and all patrons) if ever there was one. Moore was for TPP before he was against it. Watch the end of their discussion. Moore goes off claiming we are in a Cold War with China. I guess we should expect the next defense budget request to ask for a doubling of spending. The cost of the wall would be peanuts in comparison. How would Moore pay for this? More tax cuts for the rich of course. We wonder why the American electorate makes the decisions of an illiterate person. But who are the people we have delivering our “news”?? Of course when Republicans destroy state education budgets, and young people go home to watch this on their TV (or streaming) at least 2 hours a day, it works in Republicans’ favor, because citizens start voting for political candidates and agendas which actually work to their own detriment. Which is how you get guys like Mitch McConnell hiding out in a Capitol building broom closet until donald trump has figured out he’s not getting his border wall. Sales almost $10 billion as it is the largest aluminum producer in the world. Its operating margin exceeds 15% of sales representing a return to tangible operating assets near 25%. The owners of this company have a sweet deal. Oh wait – ownership has been changing. I wonder how much Jared and Ivanka own as a result of this shady dealings. As Moore correctly says, the economy is on a path to deflation. Already implicit 5-year ahead CPI inflation has fallen to 1.62%! Crude oil is down 20% yoy, fast decelerating in close-by months. The majority of key inflation indicators are decelerating. Overwhelmingly important to the inflation outlook is the stock market. The Fed-driven bubble has finally burst. Due to the donnybrook of a recession coming, price inflation will do what it did during the Great Recession. It and many other bubbles will deflate. It’s now 56% probable that recession will get underway by November. Based on an alternate methodology, the central tendency month is December – August at the earliest, April 2020 at the latest. Beating up on Moore with a triviality standard deviation stick when he gets the larger inflation picture right … well what can a man say? His cheer-leading on the Trump economy when it is likely to have its back broken in 2020 is a different matter. I wonder why Moore did not just sat that. I think a lot of economists would argue that the FED should pause any tightening of monetary policy. But advocating the use of commodity prices, which Moore has been doing, is not helpful. Memo to FED – please pay attention! JBH For quite some time you’ve been assuring us that thousands of indictments against Democrats and fellow travelers of the Deep State would be dramatically unsealed in February. You had sources!!! We just had to wait and see. Q-Anon had spoken! Well, we’ve waited. Should we still expect those tens of thousands of indictments this coming Friday? Or do you just want to admit that you were played by right-wing crazies? The only indictments I see coming down the pike are against Trump associates and family members. 2slugbaits I don’t recall ever putting a date on this. That said, there is a keystone to the arch. Special prosecutor Mueller. The 60000-plus sealed cases (indictments) are very real, a 60-1 ratio to the pre-Trump historic norm. The weight of evidence suggests Trump will not give the order to unseal until Mueller completes his investigation and makes public his findings. As you know, there has not been a shred of evidence forthcoming that the Trump campaign colluded with Russia. Campaign collusion was the original mandate, but it is glaringly evident Mueller has engaged in a fishing expedition far beyond his mandate. So when will Mueller release the report of his findings? Your guess is as good as mine. I’d recommend just sitting on your hands until then. While you wait you might read the Intro and first two chapters of Macgregor & Docherty’s Prolonging the Agony: How The Anglo-American Establishment Deliberately Extended WWI by Three-and-a-Half Years. You will learn, if you did not already know, that there were wheels within wheels within wheels running inside all major of events at that time, hidden from the public still to this day. Has human nature changed? Are there not multiple hidden wheels turning again today? Shredded documents then, erased emails today. How then do you imagine you have clear insight into today’s turnings when probably you – I assume here – do not even know what really went on in the first quarter of the last century? Though, of course, you may think you do. I must have missed how you know so much about them. Are you a former federal agent? Do you have secret, long standing contacts in the Justice Department? Is the info contained in a secret book only you and your associates have read? Did you overhear this info while dining next to Bob or Larry from the Pentagon? Father Guido at the Vatican who got the news from Father O’Reilly who took a dying declaration from somebody whose name he can’t reveal? JBH I don’t recall ever putting a date on this. I do. Several months ago you started making these absurd claims, so I asked you for a date. You promised that it would be in February of 2019. All would be revealed in February. I guess you still have a few days. I see that you’ve upped the number from 40K to 60K sealed indictments. 2slugs I’ve looked far and wide in my files and haven’t been able to locate the past comment you refer to. Do you have a copy and if so would you please post the germane part and date of posting? Thank you. 2slugsbaits: Methodologically speaking, according to the original 13 Keys which correctly predicted the winner of each presidential election since 1984, Trump is a shoo-in in 2020. Yours is just a story you tell yourself. Moreover, long before 2020 the unparalleled hidden mass corruption of higher-ups in all walks of life is going to be global front page headlines for months on end. A near-infinite line of lemmings are going to be indicted and some substantial fraction put behind bars. Starting on if not before February 2019. I read the headline and I thought John Bolton…. who is as dangerous in world affairs as Moore is in economics. Bolton was gung ho for regime change both in Iraq and in Syria. How did those 2 disasters work out? Now the man with the ugliest mustache ever is advocating regime change Latin American style. What could go wrong? I “randomly” found this video online. I hesitated to put it up here, (snicker snicker) because all the cool kids in this blog make fun of me when I put Youtube links up. Plus, they don’t like the fact I don’t wear brand name clothes and I’m on the reduced price lunch program. Oh wait, that was in grade school, nevermind. But eh, as I was saying, I was super reticent to put this up, (snicker snicker) but then I thought of all the joy, laughter, and smiles it would bring Professor Chinn to see this. Maybe….something similar to watching his children (or nieces, whatever) in a high school theater play of Shakespeare’s. That same kind of inner pride he would feel. I seem to remember (fuzzily) Professor Chinn referring to him as “My homie from the hood ‘SM Funkmastuh’ ” or even occasionally Professor Chinn calls him reverently “My homie ‘SM-3Chainz SnoopyDogRhyma’ “. When Menzie said those things about his homie “SM” (or so I fuzzily recall), I wanted to warn him it could be misconstrued as “cultural appropriation” for his “homie SM” to have those names. Then—-and only because I hate to stir up hornets’ nests, I decided to keep silent. I hope Menzie realizes this was done with affection towards the blog host and intended with good humor. Rest assured SM annoys me just as much as he annoys you, certainly more so. Trying to get a chuckle out of some of those dark things sometimes. It’s my dry humor I’ve tried to steal from my father that he was much better at applying than me.